It's Monday morning and you might have come looking for something to go with your coffee, but I'm thinking back to our Friday night casual eats. Mexican Smash Potatoes hit the spot for easy comfort food. 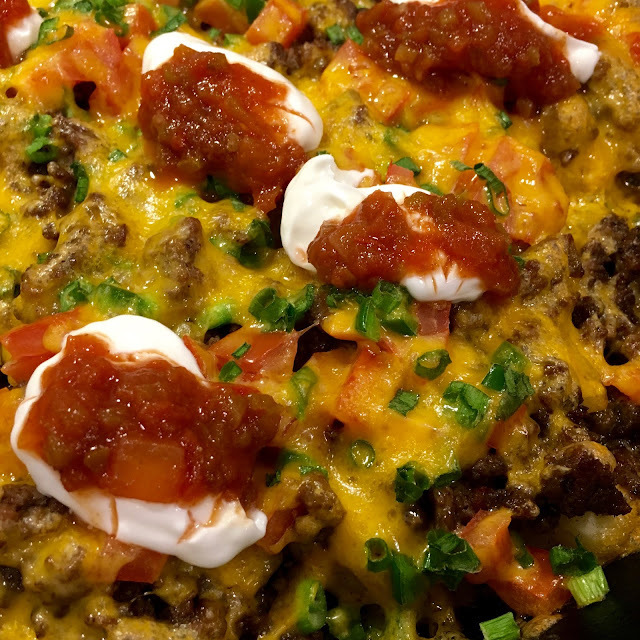 Think of potato skins meets nachos for next weekend. Recipe to feed two, but if you have more people just add more potatoes and toppings. 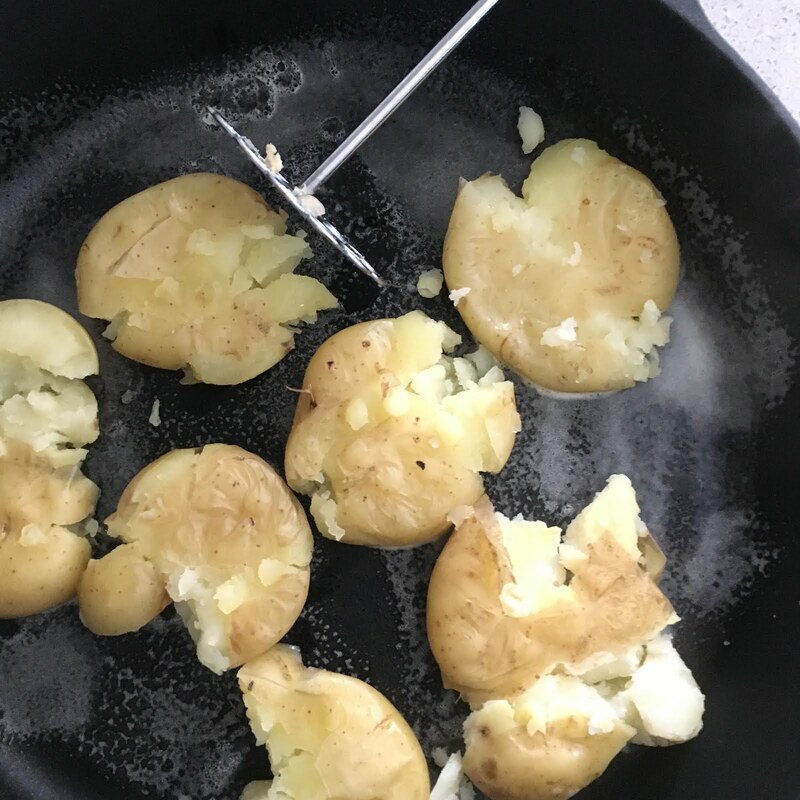 Boil potatoes until fork tender. Do not allow to get mushy. Drain and place potatoes on a baking sheet or in a cast iron fry pan that has been sprayed with none stick spray. Place oven rack in middle of oven and turn oven to broil. 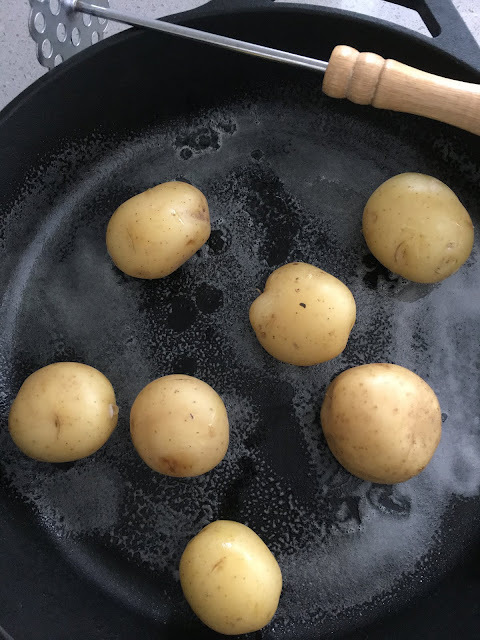 Broil seasoned potatoes until they get a nice crust on them but are not dark. Remove from oven. Top with fried and seasoned (use any of the seasonings suggested in the ingredients to your liking) ground beef, tomatoes, onions and jalapenos. Top with cheese. Once again place under the broiler until the cheese is nicely melted and bubbly. You were right about me visiting with you over a cup of coffee but I’m excited about this recipe! We go back to the ranch on Saturday and will just stay a few days. I’m so making this for us on Saturday night! Thank you! You made me laugh out loud about looking for something to go with my coffee...how did you guess?! Coffee or no, this is a clever recipe that I look forward to trying. Oh my - that looks so good!! !